Until April 22, you can actually visit and swing there for FREE! The swing had disappeared for a bit because they were replacing it with a six-seater, and making it faster. The new, improved and better swing is all ready and installed for everyone to enjoy again. So, starting from noon on April 19, until April 22, anyone can visit it for free and have as much fun as we had there! The DutchReview Crew does not often meet up in person (we’re modern like that), but when we do, we always plans the best outings. 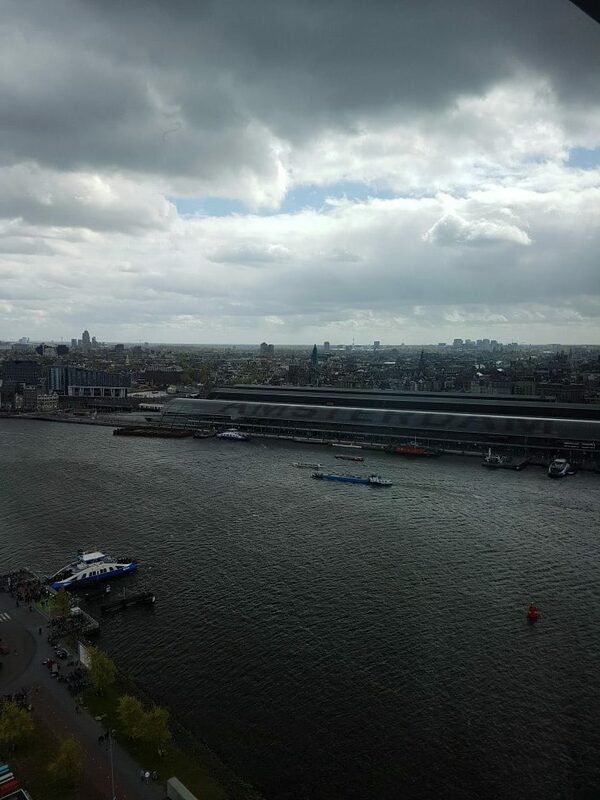 And those people at HQ delivered this time, with a brilliant view from the A’DAM Lookout Tower. So besides the expected view what else was there to see and why should you visit the A’DAM Lookout Tower? 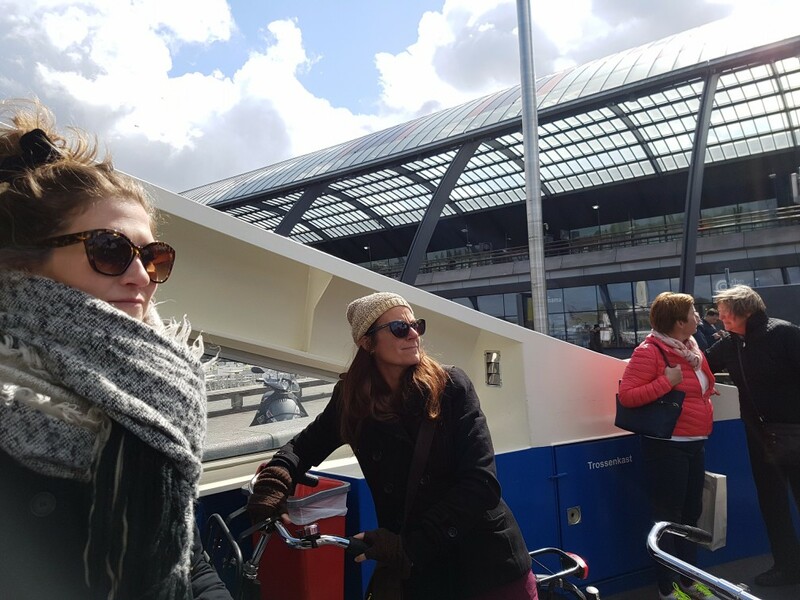 Why visit the A’DAM Lookout Tower: The Ferry! The A’DAM Lookout is just on the North side of the river, so I can already hear some of you sighing disdainfully behind your screens. But don’t fret, it’s worth the effort, trust me. If even just for the FREE ferry ride. Yes, free, exactly. 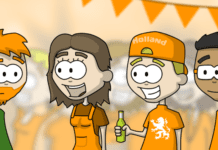 If you’re Dutch (or a resident here), then I know that the word free is already stirring some excitement deep within you. And the ferry is fun in and of itself. I mean, the nice breeze, the sunny sky, a tranquil boat trip. It’s great…just be careful of rush hour. Chilling on the ferry, with a lovely blue sky. Why visit the A’DAM Lookout Tower: A Tall(ish) building in Amsterdam? The A’DAM Lookout Tower is immediately visible across the water from Central Station, but the closer we got, the more I realized how tall this building was for Amsterdam standards (for other standards not so much). 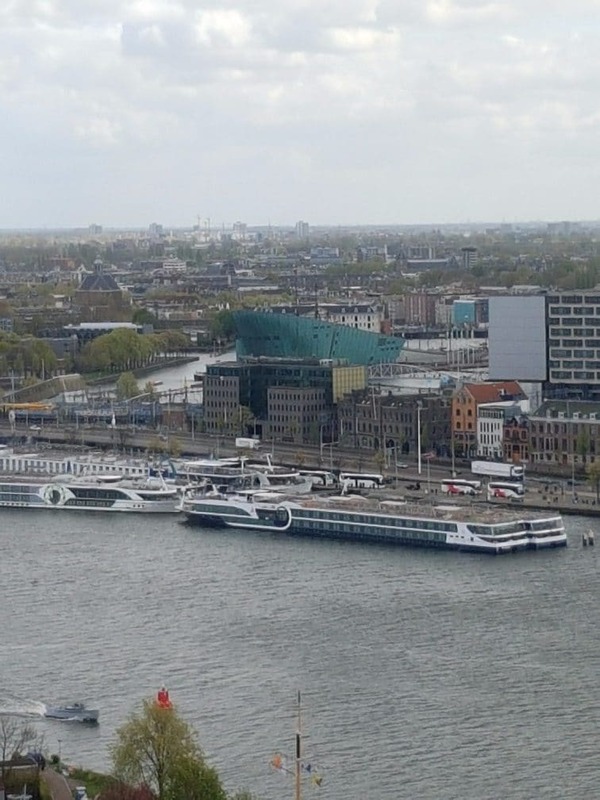 Although it stands at a modest 80m in height, the A’DAM Lookout is still somehow the 22nd tallest building in the Amsterdam, and probably the tallest building in the city center. A perfect place to look over the mostly vertically challenged city. What’s really cool about the place, though, isn’t necessarily its height. It’s really the view that makes this place worth a visit (yes, even if that means crossing into Noord). 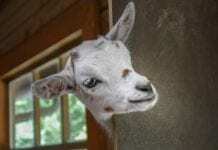 Just check out these awesome pics. But I’m getting a bit ahead of myself, because the fun starts way before you set your eyes on Amsterdam’s lovely skyline. Even before we got on the elevator, we got the chance to take this awesome picture. ….I mean, this picture was totally taken after our elevator ride. Because it’s totally real and definitely not in front of a green screen. Anyways, then comes the elevator. A’DAM Lookout’s very own Experience Elevator. 20 floors in 22 seconds. It’s pretty cool. WARNING: A lot of flashing lights. When the experience elevator ends, you step out onto the building’s penthouse, which hosts a bar and restaurant. You can walk around the floor uninterrupted to get a clear view in every direction. There are even a number of fancy tablets fixed onto the walls to help indicate the notable points in the view. 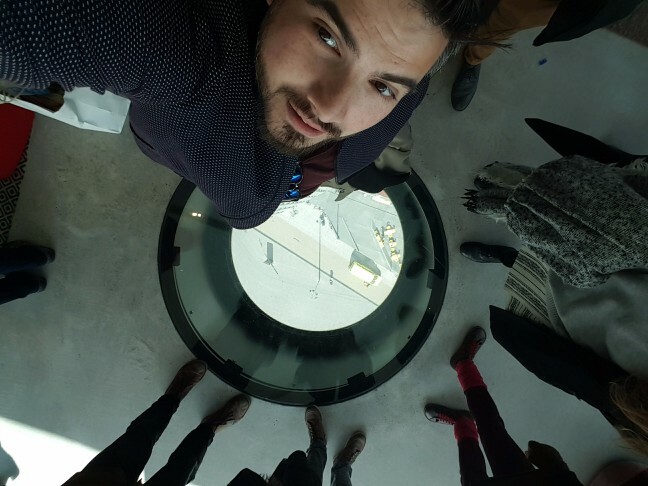 You can look straight down through a glass floor too if that’s what you’re looking for. The bar and restaurant are an attraction in themselves, of course, for who wouldn’t want to dine in style while enjoying the sights of the Dutch capital? 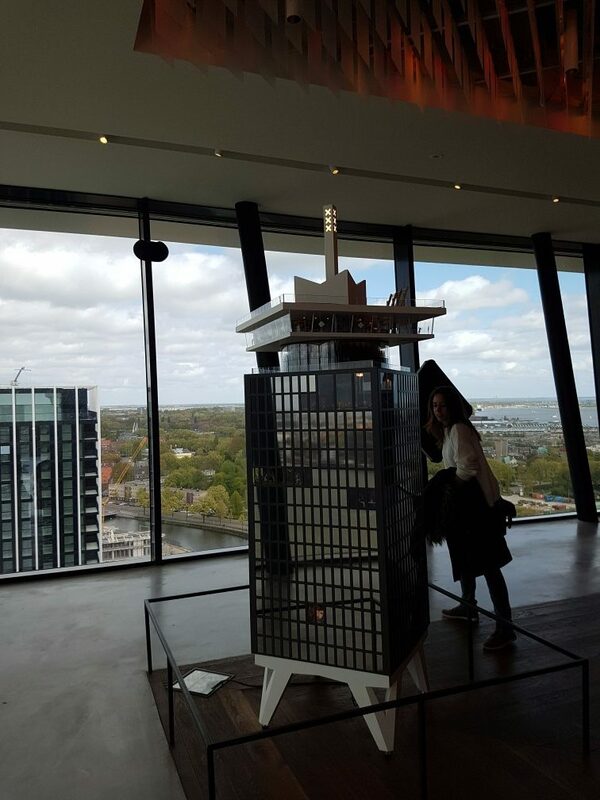 Besides that, there are a number of displays strewn about the place, including a miniature model of the A’DAM Lookout Tower itself (complete with brilliantly creative dioramas that held the attention of the DR Crew longer than we’ll admit to). A miniature A’DAM Lookout Tower in the A’DAM Lookout Tower. Wicked. Look! a Feyenoorder making out with an Ajacied. These dioramas are crazy. Yup, that’s a (relatively) giant butterfly. There’s even a miniature Amsterdam. Yup, there’s a roof terrace too. Just a short flight of stairs up from the penthouse, you can step out into the open air and enjoy the clear blue skies of Holland (that is, given the sky is clear that day, like it was for us). This is also the location of one of A’DAM Lookout’s greatest selling points: the swing. If you’re a thrill-seeking daredevil, then you’ll want to swing right over the edge. 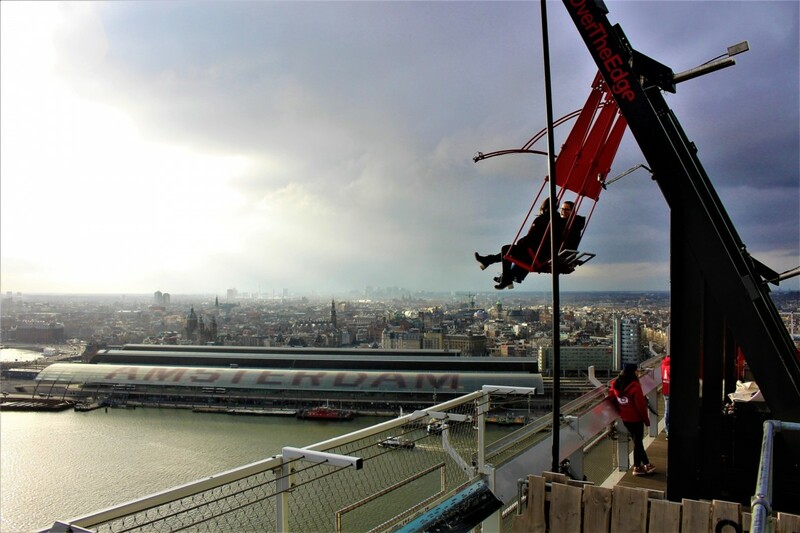 The swing on the A’DAM Lookout Tower is Europe’s tallest swing and leans right over the edge of the terrace. Visitors with a bit more courage than us have the opportunity to swing peacefully at 100m (!) above the ground. We may not have strictly-speaking been on the swing, but at least we saw it. Of course, when you’re all done visiting, the gift shop has some interesting souvenirs. 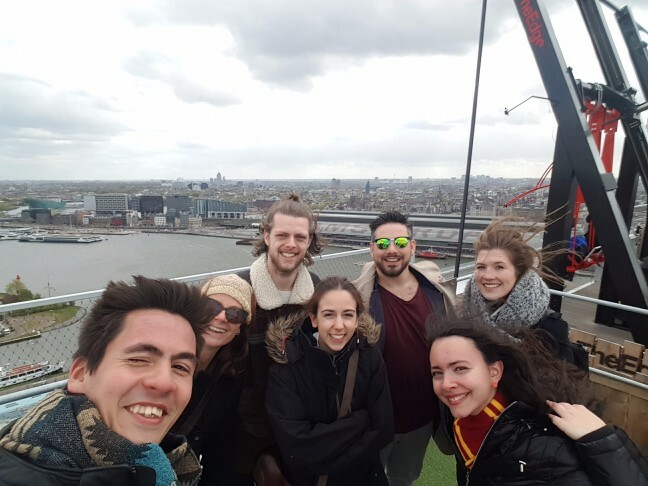 If you’re looking to experience A’DAM Lookout yourself, the tower is open daily from 10:00-22:00, so you can visit at whichever time best suits you. For more information, check out their website. THE BUTCHER Social Club is also right next door, which is also certainly worth checking out if you want to have some post-visit drinks as well. Or check out the EYE museum which is also right next door! 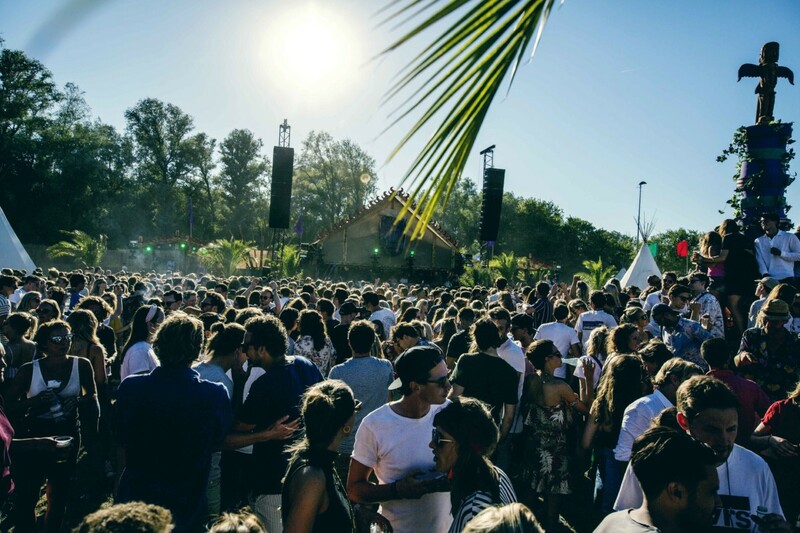 Are you looking for other cool stuff you can do at Amsterdam so that you can combine it with other things to do? 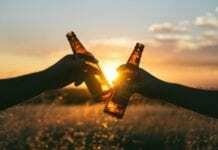 Check out the best coffeeshops there, the best place for the munchies, the best ice cream you can get, and other fun stuff you could do! Noah grew up in Dhaka, Jakarta, and New York City before finding his way to Rotterdam (and now back to New York again). Despite having recently snagged a bachelor’s degree at Erasmus University College, he is fully committed to postponing adulthood as long as possible. I’m not really scared of heights but I don’t think I could go in the swing. It would kind of freak me out. The rest sounds like fun though. The lift looks really cool.